Andrzej Duda in April 2013. Photo Piotr Drabik, (CC by 2.0). All over Poland people got up, switched on their TV sets or radios, and over their morning cups of coffee heard that they had elected the opposition candidate, Andrzej Duda, to be president of Poland. Almost until the last moment, pollsters were predicting a victory for the incumbent, Bronisław Komorowki. But it was not to be. When the election news blackout was lifted at 22:30 exit polls indicated that the newcomer had secured a decisive 6% lead. Shortly before midnight Komorowski conceded defeat. It had been an election largely fought on negative point scoring. Opponents of President Komorowski, accused him and the governing party, Civic Platform (Platforma Obywatelska) of employing communist-era officials in key government positions, turning a blind eye to fraud and corruption in high places, and preferring to ignore the problems of ordinary people. Opponents of Duda, ridiculed his membership of the Law and Justice (Prawo i Sprawiedliwość) party which is portrayed by the mainstream media, as a bunch of religious bigots obsessed with the circumstances of the Smolensk aeroplane crash which killed President Lech Kaczyński. The danger in conducting negative campaigns is that while two candidates tear each other apart, a third can emerge quietly from the wings… . And so it was that ageing rock musician, Paweł Kukiz, emerged as the surprise youth candidate and garnered over 20% of the vote in the first round of the elections. While Kukiz took no part in the second round, he and his supporters are already gearing up for the parliamentary elections due in October. It seems likely that neither Law and Justice, nor Civic Platform will gain an overall majority in the parliamentary elections and that there will be a coalition government. 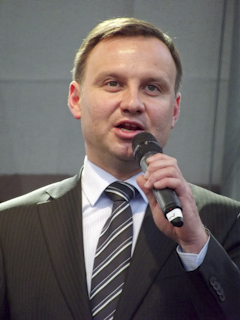 Andrzej Duda, born 16 May 1972, is a lawyer and a Member of the European Parliament. He comes from Krakow, the son of Janina Milewska and Jan Tadeusz Duda. His wife, Agata Kornhauser, is a high school German teacher. His father-in-law is Julian Kornhauser, a well-known Polish-Jewish writer, translator and literary critic. He began his political career with the now-defunct Freedom Union Party (Unia Wolnóści) in the early 2000s, but after the parliamentary elections in 2005, began his collaboration with the Law and Justice Party. In 2010, he was an unsuccessful candidate in the elections for the Mayor of Kraków, but was more successful in the 2011 parliamentary election, where he received 79,981 votes for the Kraków area, becoming a member of the Polish Parliament’s lower house, the Sejm. He did not complete his term, becoming elected in 2014 as a member of the European Parliament. He was the official candidate of the Law and Justice party for the office of President of Poland in the 2015 Polish presidential elections. He won the election with 52% of the vote. He is President-elect of Poland and will take up the office of President on 6 August 2015. This entry was posted on Monday, 25 May 2015 at 13:44 and is filed under Andrzej Duda, government. You can follow any responses to this entry through the RSS 2.0 feed. You can leave a response, or trackback from your own site. It was an interesting election to observe. Watching the exit poll announcement whilst sat in Warsaw, I was amazed at how quickly Komorowski conceded defeat. I was also surprised by the delay to the closing of the polls, due to the death of an individual at a polling station. It will be interesting to see how this pans out. Both Duda and Kukiz have both promised to lower the retirement age again. Quite how Poland will pay for this, when the rest of the world appears to be raising the retirement age remains to be seen. I fear short term populist politics at the expense of economic stability….